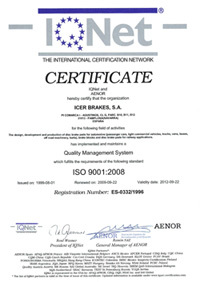 The system which guarantees the quality of ICER has been audited and certified by AENOR, which belongs to the international quality organisation called IQnet. Type 0: Tests of brake efficiency with loaded and unloaded vehicle. Type 1: Fading Tests: A series of 15 applications speed with the objective of increasing the temperature and comparing the performance at low and high temperatures. Type 2: Behaviour at prolonged descents. Efficiency: A comparison of efficiency by comparing the braking values between the original equipment and our material for every hydraulic pressure value. The results must be in the range of +/- 15%. Sensitivity to velocity of the efficiency of the braking material. The same tests are to be carried out at 65 Km/h, 90 Km/h and 135 Km/h for the front axle and 45 Km/h, 65 Km/h and 90 Km/h for the rear axle. This is to test if the deceleration is maintained independent of the velocity. Sheer Test: To ensure the adherence of the brake pad to the metallic support and the resistance must be higher than 250 N/cm2. The Kraus test: To execute a series of braking cycles controlling the surface/superficial pressure and the temperature of the material and noting the coefficient values of the minimum, maximum, and operational friction for subsequent control of production. The results are to be presented in the report of the standardising authority (generally an organisation dependant on the Ministry of Industry). Standardization.The standardising authority audits the system of quality control of the manufacturer to ensure future production conformity (C.O.P. –Conformity of Production), that ensures the maintenance of a standardised quality on a continuous basis. The innovation and improvement of our quality, an increase in our response and leading delivery time, as well as continued product diversification are the keys toICERás competitiveness. The most modern technical resources incorporated in our Research & Development Department have made possible the formulation of the friction materials most adapted to each requirement, in response to the permanent challenges of the automotive industry. ICER BRAKES has a very modern Technology Centre where its highly experienced personnel undertake the research of new materials and the development of new processes. 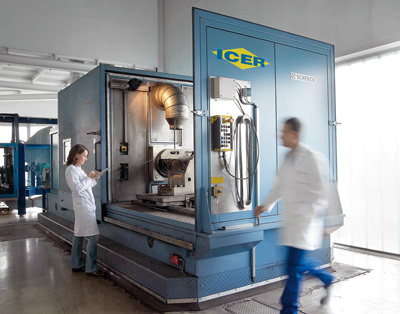 This, along with the most advanced technological testing, allows Icer to continue creating new products capable of satisfying the needs of the market. 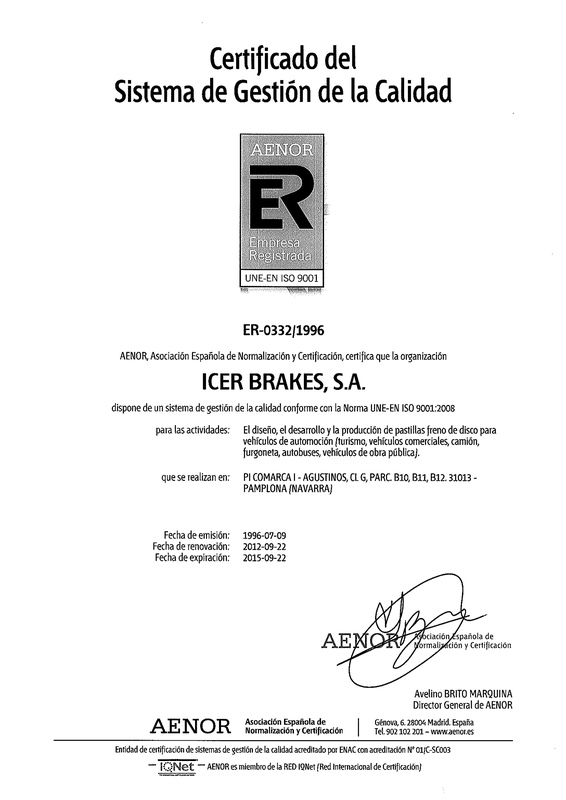 ICER BRAKES makes dynamometer tests to real scale for all its range of products both in laboratories and in test vehicles.